On the textualcriticism discussionlist, Arie Dirkzwager draws the attention to Young Kyu Kim's article "Palaeographical Dating of p46 to the Later First Century" which is available online here. ... followed by several other messages in the thread. 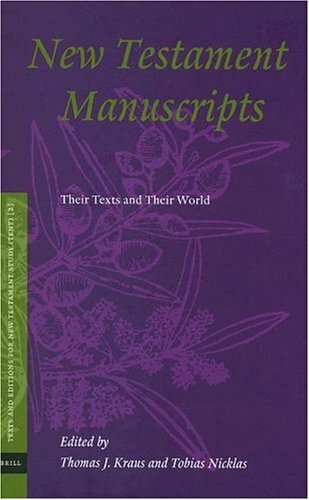 While writing a review for New Testament Manuscripts: Their Texts and Their World, I discovered that Prof. Larry Hurtado has made his chapter available online, with permission from the publisher, here. The chapter is a reworking of a chapter in The Earliest Christian Artifacts: Manuscripts and Christian Origins. Old ETC posts on this book are here and here. The text of the first few words of Romans 7.25 seems pretty unsettled. It occured to me today during a supervision that there are two other readings with better ancient support than the NA27 reading (XARIS DE TW QEW - the earliest proper manuscript support for this is ninth century! ); and that the best attested reading was probably EUXARISTW TW QEW (01; 02; 1739; 1881; Maj. syr. ; probably also Marcion). If we accept this reading on the basis of the manuscript support, then there is no interjection in 7.25a; but the EGW continues to speak throughout (indeed perhaps until 8.2). Textual criticism and exegesis are hand-in-glove. On the use of laser on the Book of Kells see here. After a brief and helpful introduction (by SM), the book consists of 142 lovely full colour photographs of manuscripts held in the British Library. "Bible Manuscripts" means actually "Christian Bible Manuscripts" (since Hebrew Manuscripts have their own book in the series). Of Greek New Testament ones there are some fairly predictable majuscules (e.g. P5, P18, 01, 03) and a few minuscules (699, 640, 113). The vast majority of manuscripts offered (reflecting something of the weight of material in the West and hence in the British Library) are Latin (although Old English, Old Saxon, Syriac, French, Serbian, English, Dutch, German, Catalan, and Church Slavonic are all represented, as is the Harley Trilingual Psalter in Greek, Latin and Arabic), and the majority of the photographs, as is common in these sorts of collections, are of pages with decorations, canon tables, portraits etc. and not always a lot of text. So the collection is more useful and interesting for thinking about the history of the influence and interpretation of the Bible than about the text itself. the Apocalypse produced a high proportion of interesting illustrations (certainly compared to the proportion of Greek manuscripts, since here it is the least well represented portion of the New Testament - perhaps the situation in relation to the Apocalypse in Latin manuscripts and Latin lectionaries is different [does anybody know?]). London, British Library, Add. MS 5111 contains two leaves of 'an extraordinary deluxe manuscript of the Four Gospels' - perhaps 6th century, gold ink, beautiful decorations etc. But this manuscript has never been used in any edition of the Greek NT and is not listed in any normal list of NT manuscripts. I never knew it existed until now. And the reason for such careless neglect? The book is published as one aspect of the current British Library exhibit on Sacred Texts from Christianity, Judaism and Islam: "Sacred: Discover what we share", which is an interesting (!) angle to take. I am not quite sure why "Sacred: Discover the differences" wasn't chosen. Tony Chartrand-Burke offers a wonderful little booklet, Collating for Dummies, which is a step-by-step guide for collating MSS. (The focus is on apocryphal/patristic texts but many things are useful for collators of NT MSS.) Tony prepared this guide when he was working on his dissertation—an edition of the Infancy Gospel of Thomas—as a PhD student at the Centre for the Study of Religion, University of Toronto. The dissertation "The Infancy Gospel of Thomas: The Text, its Origins, and its Transmission" is available here. Peter M. Head, ‘The Gospel of Judas and the Qarara Codices: Some Preliminary Observations’ Tyndale Bulletin 58.1 (2007), 1-23. Peter J. Williams, ‘P115 and the Number of the Beast’ Tyndale Bulletin 58.1 (2007), 151-153. I seem to have heard of these chaps somewhere before. Over at RBL, Christopher Tuckett presents a useful review of New Testament Manuscripts: Their Texts and Their World by Thomas Kraus and Tobias Nicklas ( editors). Description: New Testament Manuscripts: Their Texts and Their World comprises twelve essays dealing with manuscripts of the New Testament and/or what we can learn from them today. Starting from different angles the contributors — distinguished scholars of international reputation — focus on the fascinating and thrilling stories manuscripts tell, for instance about the times they were produced in or the people who handled them. The multitude of manuscripts used for establishing the critical text of the New Testament is often only perceived as abbreviations in form of single letters or numerals, and today’s biblical scholars may hardly ever take notice of the specific features of an original manuscript, above all those not mentioned in a critical edition. Therefore, three sets of contributions deals with the conditions under which manuscripts from the early days of Christianity were produced and transmitted, specific individual manuscripts, and then special features observed in and with the help of various manuscripts. In a final essay the usual method of how to organize and categorize New Testament manuscripts is challenged and an alternative method proposed. The essays are linked with each other so that readers may get a feeling of how astounding an occupation with the original manuscripts of the New Testament and the days of the early Christians can be. The list of contributors reads (partly) like a list from the sidebar of ETC! In the end Tuckett says: "This is a fascinating collection of essays showing how much light can be shed from a consideration of concrete manuscripts and taking seriously the evidence they provide for illuminating the social and religious world in which early Christians lived out their faith and produced their written texts." 1. The XXV International Congress of Papyrology is on from July 29 - August 4 2007 at the University of Michigan. The programme (they obviously call this a program, but we won't fall for that one here) features loads of papers of interest to biblical text critics (by Scott Charlesworth, Don Barker, Juan Chapa, Anne Marie Luijendijk) and others which look interesting from an exegetical and Umwelt perspective, as well as papers on palaeography and Greek language. The programme (ha!) is available in pdf, as are abstracts, and can be accessed here. I wonder if anyone is planning to attend who might blog some of the papers for us? 2. Rick Brannon is blogging on manuscripts of the Pastoral Epistles: intro and 0259 and 0262 (this last with a photo and a strange comment about me). 3. Stephen Carlson has written on conjectural emendations proposed for 1 Cor 4:6, discussing James C. Hanges, “1 Corinthians 4:6 and the Possibility of Written Bylaws in the Corinthian Church,” JBL 117 (1998): 275-298; and 1 Cor 15:31-32, discussing Dennis R. MacDonald, “A Conjectural Emendation of 1 Cor 15:31-32: Or the Case of the Misplaced Lion Fight,” HTR 73 (1980): 265-276. The Editio Critica Maior has seen at least two fundamental developments take place within the period of publication of the first four fascicles (1997-2006). These two developments are related, fundamental to the Editio Critica Maior, and important for understanding future plans within NT textual criticism. Firstly, this relates to the method by which the external witnesses were evaluated prior to the determination of the published text, the A-text (Ausgangstext), the text which stands at the outset of the transmission history. Specifically the edition has come to use a distinctive new method, the Coherence-Based Genealogical Method, which has been progressively developed over the last decade or so while work on the ECM was moving forward. We shall explain this method more fully later on, for the moment I simply want to note that it has been progressively applied. The James instalment, published in 1997, states only that ‘the text is established on the basis of all the evidence presented’ (11*), and doesn’t mention any new method at all. The Peter instalment, published in 2000, utilises a new method, without giving it such a clear title, based on ‘coherent groupings of genealogical significance among the witnesses’ (p. 23*). The 1 John instalment (2003) then explicitly appeals to ‘the Coherence-Based Genealogical Method’ (‘Preface’). In the final instalment (2&3 John Jude, 2005) this method is used and even abbreviated to CBGM (e.g. 37*-38*). Secondly, this relates to the behind-the-scenes mechanisms for storing and manipulating the raw material, the transcriptions of manuscripts which form the ultimate data on which the edition is based. The 1 John instalment (2003) is the first to mention the ‘conversion of manually recorded manuscript collations to completely computerized transcriptions’. These transcriptions ‘were checked for discrepancies with the aid of the Collate program’ (‘Preface’, XVI). Wachtel and Parker explain that is was only after the launch of the first instalment, and at the same SBL meeting in San Francisco, November 1997, that they became acquainted with Peter Robinson’s work on The Canterbury Tales ‘a truly amazing electronic edition in which the user could interact with transcriptions and critical apparatus and images of the manuscripts, along with commentary and interpretative data’ (K. Wachtel & D.C Parker, ‘The Joint IGNTP/INTF Editio Critica Maior of the Gospel of John: Its Goals and their Significance for New Testament Scholarship’ [SNTS 2005; on-line], 1.). The use of the Collate software for the entering and analysing and presenting of the textual data must have been initiated then at some intervening point. It is obvious from these two points that the ECM project has actually been a project in transition. Initiated using traditional data-handling techniques (i.e. manually recorded manuscript collations) it has become a much more technologically equipped project, with a special commitment to the Collate software and the comparison of complete collations (with promised access to images). From a method perspective as well it was initiated using traditional text-critical method and argument, but has now adopted an innovative new method (CBGM). In Baptist Press (online magazine), Jason Hall posted a report on May 16, from the recent symposium at Southeastern Baptist Theological Seminary on the ending of Mark. Participants in the symposium included Darrell Bock, Dan Wallace, J. K. Elliot, David Alan Black and our co-blogger Maurice Robinson. Read the whole report here. Tommy Wasserman is now Academic Dean and Lecturer in New Testament at Örebro Theological Seminary. Congratulations, Tommy. There is quite a lot going on at the moment on issues relating to the NT canon, the reception history of Luke-Acts (or lack thereof), gospel traditions in the second century etc. But I feel a bit constrained from discussing them here because they are not strictly speaking 'textual criticism'. What do you think? Should we stick to variants, manuscripts, methods and textual criticism; or can we also touch on canon issues (which are indeed often closely connected with textual criticism and history)? Here is the next instalment of the minuscule manuscript seminar sample. For earlier samples see Seminar One (ms 461; AD 835), Seminar Two (ms 1582; AD 949), Seminar Three (ms 623; AD 1037), Seminar Four (ms 2138; AD 1072). I am sorry that this is again a fairly small excerpt. I shall see what I can do in terms of finding a full page. But while I am looking what do you make of this? Following on from the interest we have seen in EpiDoc training events (including recent sessions in Rome and San Diego) and the success of the London EpiDoc summer school over several years now, we shall be holding another week-long workshop here at King's College London, from the 11th-15th June this year. • The EpiDoc Guidelines provide a schema and associated tools and recommendations for the use of XML to publish epigraphic and papyrological texts in interchangeable format. For a fuller description of the project and links to tools and guidelines see http://epidoc.sf.net/. • The Summer School will offer an in-depth introduction to the use of XML and related technologies for publication and interchange of epigraphic and papyrological editions. • The summer school is targeted at epigraphic and papyrological scholars (including professors, post-docs, and advanced graduate students) with an interest and willingness to learn some of the hands-on technical aspects necessary to run a digital project (even if they would not be marking-up texts by hand very much themselves). Knowledge of Greek/Latin, the Leiden Conventions and the distinctions expressed by them, and the kinds of data and metadata that need to be recorded by philologists and ancient historians, will be an advantage. Please enquire if you're unsure. No particular technical expertise is required. Brian James Wright: Jesus as Θεός: Scriptural Fact or Scribal Fantasy? ETC readers will probably be interested in the argument (although he can't quite bring himself to commit to the correct [!] view of Galatians 2.20). Any takers? Is Tommy's book really that cheap? I'm just writing a review of Tommy Wasserman's excellent book. I've been sent details of the price by the journal Themelios saying that it only costs £14.15 of USD 28.36. Is it really that cheap? This is cheaper than previously advertised prices and amazingly good value. Everyone should order one. I'm also doing a review for BBR. From Blurb: "This book details the development of what appears to be the first system constructed to aid experts in the process of reading an ancient document, exploring the extent to which techniques from Artificial Intelligence can be used to develop a system that could aid historians in reading the stylus texts." As part of the programme of the Fifth Birmingham Colloquium on the Textual Criticism of the New Testament, on which we have previously reported, there was on April 17 an excursion to Hereford Cathedral to see their manuscript collection in the "chained library," including the Mappa Mundi (read more about the collection here). The librarian first introduced us briefly to the library and its holdings. Then we had the chance to look specifically on some significant Latin manuscripts on display, picked out by Professor David Parker. The first manuscript, which David Parker presented to us, is the most significant in the collection; the Gospels codex known as "The Hereford Gospels" (Hereford, Cathedral Library, MS P. I. 2 ). This is an eighth century illuminated Gospel book written in insular minuscle script, with large illuminated initials. Interestingly, it contained also a very old report on a legal decision on some matter not directly related to the manuscript itself, but in which the judge decreed that the decision should be written up "in the copy of the Gospels at Hereford Cathedral" - showing that this was already a famous manuscript then! The next manuscript, a Gospel Harmony of Clement of Llanthony, dated to the 13th century, was presented by the doctoral student Cherish Ahlgren who is writing a dissertation on the subject. On the image to the right Cherish is carefully turning the pages of the codex. A JBL article on the Gospel Harmony of Clement by Rendel Harris is available in JSTOR (free for SBL members via the SBL-site) here. A third manuscript was presented by the main organizer of this colloquium, Dr. Hugh Houghton (holding the MS on the picture), who had the specific expertise on this codex, which contains two works relating to Augustine. First his Tractatus in euangelium Iohannis, and then the biography by Possidius, Vita S. Augustini. A manuscript with the same contents produced in England at roughly the same time is in the Bodleian Library. See description here (Ms. e Mus. 6). In sum, the excursion was as nice, interesting, and well organized as the whole colloquium, not least thanks to Hugh Houghton. More pictures from the colloquium are available here. Editio Critica Maior: How Big Will it Be? Now, the recently completed Catholic Epistles, although initially published in eight separate fascicles, is basically containable in a single physical volume (649 pages in my calculation); but the rest of them are not going to be. You would have to think that the Gospels, although ostensibly a single "volume", will no doubt require at least two physical volumes each (perhaps Mark may be able to be presented in a single volume); and probably something similar could be said for Acts (i.e. at least two physical volumes); while Paul’s letters will certainly also need to be published in up to six volumes, with Revelation requiring perhaps two. This would mean the total might be nineteen physical volumes - NINETEEN. And I am not counting the additional volumes of supplementary studies and textual commentary which are also promised. By way of comparison, the Catholic Epistles take up 43 pages in NA27 (out of 680 pages in total); if this was representative and proportional we might expect the whole NT to take up 680/43 or 16 volumes. But the Catholic Epistles were chosen (I seem to remember this) partly because there are fewer manuscripts and fewer harmonistic type variants so the whole show is simpler in the Catholic Epistles. There are almost four times as many manuscripts of John than of the Catholic Epistles! So perhaps nineteen is an underestimation. Anyway, I'm going for nineteen: you heard it here first, the ECM will take up NINETEEN physical volumes. Or do you have a better estimation? Probably everyone knew this already, except for me, and it probably isn't new news, but just in case it is, I observe that (der) Spiegel (translated here) records that HRH Prince Charles (son of Queen Elizabeth, currently in the USA) wants Sinaiticus returned to Egypt. Prince Charles is also chairman of the St Catherine's Foundation. I've been informed by a correspondent that IVP USA are publishing (June 2007) a response to Bart Ehrman's Misquoting Jesus , namely Timothy Paul Jones' Misquoting Truth: A Guide to the Fallacies of Bart Ehrman's "Misquoting Jesus". Introduction: A New Breed of Biblical Scholar? 1 Truth About "The Originals That Matter"
4 Truth About "Misquoting Jesus"
Concluding Reflections: "It Fits the Lock"
Appendix: How Valuable Is the Testimony of Papias? I do not know of the author's text-critical credentials, and observe that commendations have generally not been from textual critics (T. Scott Caulley's said the most), but while I wouldn't necessarily expect earth-shattering insights on textual criticism in the book there is plenty of room for a work that shows weaknesses in argumentation in Ehrman's original book. Besides, I shan't be complaining about how others do the job, having turned down an offer from another publisher to write a response to Ehrman's MJ. The funniest aspect of the book is probably going to be the cover, which has Jesus and the disciples upside down, rather like the upside down Hebrew on MJ. "Parsons, who recently retired from the Regius Chair of Greek at Oxford, has been involved with the Oxyrhynchus project for almost half a century. His aim in City of the Sharp-Nosed Fish is to use the surviving scraps of papyrus to provide a guide to the life and letters of this ancient city for the non-specialist as much as for the professional Classicist. (The original germ of the book came from a “Commentary” in the TLS in 1998.) He writes with tremendous verve and wit, and with memorable turns of phrase. I liked, for example, the idea of Egypt being the “California of opportunity” to the Ancient Greeks. The sheer elegance of his style tends to make the reconstruction and synthesis he has attempted look effortless. In fact, it depends on truly phenomenal learning and expertise. It is hard enough to decipher the handwriting of these documents, let alone to work out how any particular fragment might fit into a bigger picture, and then to explain it to a general audience, as he does, without dumbing down." There is another review in New Statesman here. On the BBC pages there is a quiz to test your knowledge about Oxyrhynchus, I got the score 7/10 (before reading the pages), try to beat me, good luck! This is just a rather belated explanation to say, for those who hadn't already observed it in action, that Tommy Wasserman and Peter Head are now coordinating the blog, i.e. are Blogmeisters. They are now the contacts mentioned at the bottom of the page and are the ones to whom announcements should be sent. I will continue to post, though not with the same frequency as formerly. My semi-retirement is, of course, connected with what I expect will be the rather demanding job of being Warden of Tyndale House. I have just finished reading a new book (for an RBL review): Matthew C. Williams, Two Gospels From One: A Comprehensive Text-Critical Analysis of the Synoptic Gospels (Grand Rapids: Kregel, 2006). You'll have to wait for the review, but there was something about this book that I find deeply troubling, its title. This book has probably the most opaque and inappropriate title and subtitle combination in the history of mankind. Basically the title is opaque and the subtitle is completely inaccurate. I am sorry to have to say this, but I really need to get this off my chest so that I can review the actual contents of the book. Having read the book I think that Two Gospels From One means that two gospels, i.e. Matthew and Luke, are derived in some fundamental and literary way from one other gospel, i.e. Mark. There have been other ways to talk about this (‘Markan Priority’, ‘the two source hypothesis’ spring to mind), but for some unexplained reason the title attempts a new and obscure way to suggest this. ‘the Synoptic Gospels’ normally mean Matthew, Mark and Luke (the quotations come from the Concise Oxford Dictionary, but I have been assured that they also work in American). So I was disappointed to find that this book actually contains an examination of the Nestle-Aland apparatus to 173 verses of Mark, which yields results that are then applied to the relationship between Matthew and Mark in these same 173 verses, with a view to making a contribution to the study of the synoptic problem, specifically the question as to whether Mark or Matthew should be regarded as having literary priority in relation to the other. So, just to get this off my chest, it is not ‘comprehensive’, it is not a ‘text-critical analysis’ and it doesn’t deal with ‘the synoptic Gospels’. Perhaps I am out of line here. After all, I wrote a book entitled Christology and the Synoptic Problem: An argument for Markan Priority, because the subject of the book was the use of christological data in the synoptic problem and I constructed an argument for Markan priority. I write articles with titles ranging from ‘On the Christology of the Gospel of Peter’, through ‘Singular Readings in the Early Fragmentary Papyri of John: Some Observations on the Habits of New Testament Copyists’, to ‘The Gospel of Judas and the Qarara Codices: Some Preliminary Observations’. I may veer to the functional extreme, I don’t know. But this title is patently out of line, it is false advertising. Even more shocking that it comes from an evangelical Christian publisher whose primary mission ‘is to develop and distribute—with integrity and excellence—trusted, biblically based resources that lead individuals to know and serve Jesus Christ.’ So where is the ‘integrity’ here? How does this invite ‘trust’? Just not good enough I’m afraid. From the very beginning Christianity was a religion of books—a lived, but also a written faith. The essays in this collection focus on the ways in which books were produced, used, treasured, and conceptualized in the early Christian centuries (AD 100–600). During this crucial period, just after the New Testament writings were composed, Christianity grew from the religion of a tiny minority in the eastern Roman Empire to the religion of the empire itself, and beyond. To no small extent, this success was based on the power of its books. Written by experts in the field, the essays in this volume examine the early Christian book from a wide range of disciplines: religion, art history, history, Near Eastern studies, and classics. Topics include theories of the book, book production and use, books as sacred objects, and problems of gender, authorship, and authority. By examining Christian books from multiple perspectives, this book invites readers into the entire “bookish” world of early Christianity: a world of writing and reading practices, of copying and exchanging texts, of persuading and debating with books, and of representing holiness and power through codices of the law, the scriptures, and the lives of the saints. Essays cover a wide geographical range and discuss texts written all across the Mediterranean world—in Greek, Latin, Coptic, Syriac, and Hebrew. All ancient texts are translated into English, some for the first time. Intended for general readers, students, and scholars alike—anyone with a serious interest in early Christianity—this work brings together exciting currents of new research. It also opens up fresh questions and lines of inquiry in the study of this perennially important and fascinating subject. According to several reports the Vatican Library is to close from this summer (from 14 July 2007) for three years worth of rebuilding works (reopening in September 2010). There will be no access to books or manuscripts during this period. See the BBC report. According to the BBC photographic images can be requested during this period. The necessary forms for photographic requests can be found here. J.K. Elliott "John 1:18 'God' or 'Son': Stalemate?" Ελλιοτ ἐρωρτᾶ εἰ ἴσως ἀξιώσωμεν τὰς ἀμφοτέρας ἴσας. I just received today a copy of (some of) the collected essays of Neville Birdsall (J. Neville Birdsall, Collected Papers in Greek and Georgian Textual Criticism [Text and Studies, 3rd series, vol. 3; Piscataway, NJ: Gorgias Press, 2006]. A splendid collection (though it is to be regretted that understandable space considerations precluded the republication of his magnificent essay in the Cambridge History of the Bible). The one essay I had not previously seen was his 1984 inaugural lecture at the University of Birmingham, and I promptly read it with much interest. It is very much worth a thoughtful read. "Second of the peculiarities of the text of the New Testament is that which arises through the use of these documents as the standard of reference in theological discussion. Changes came about which were intended as elucidations of the true meaning of the text, or to guard against false meaning being imported into the interpretation of the text. This has often been denied, but in my view the evidence cannot be gainsaid. The changes are not great, their reasons can readily be perceived: but they are there and we can trace the development of doctrine in them." (p. 6) For an essay delivered in 1984, the phrasing of some of his statements is remarkably prescient.